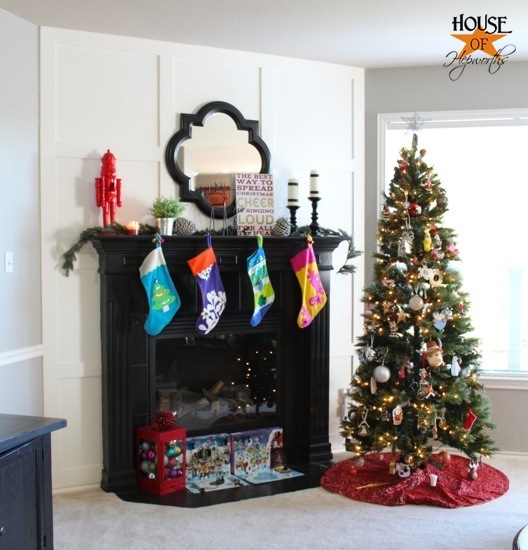 Want a simple inexpensive way to update some tired Christmas decor? Cover it with spray paint. Ever since I gave some dollar store nutcrackers a coat of spray paint two years ago I’ve totally been digging the clean streamlined look. After Christmas last year I found this huge nutcracker over at the thrift store for only a few bucks. 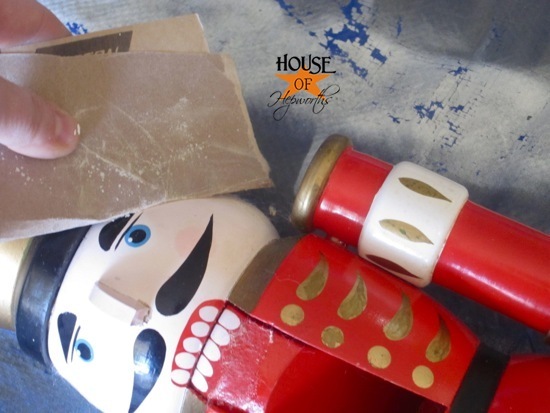 I scooped him up, stuffed him in my attic, and have been eagerly anticipating his makeover for a year. He wasn’t gross or ugly before. Some people really love the traditional look (as do I), but I wanted him to be more modern looking up on my mantle. 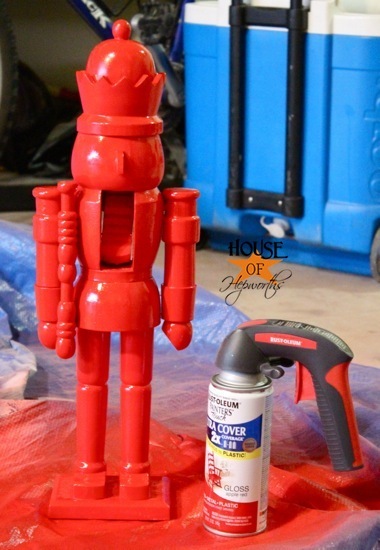 I opted to give him a few coats of bright red glossy spray paint. Don’t worry, I didn’t paint over a one-of-a-kind expensive nutcracker. This guy had a k-mart sticker on the bottom. I started by removing all his fuzzy hair. It was pretty easy to rip the hair and beard off, but it did leave a bit of glue residue. I removed all the remaining glue by using some 220 grit sandpaper. I also gave him a once over with the sandpaper to get any additional grime off him. 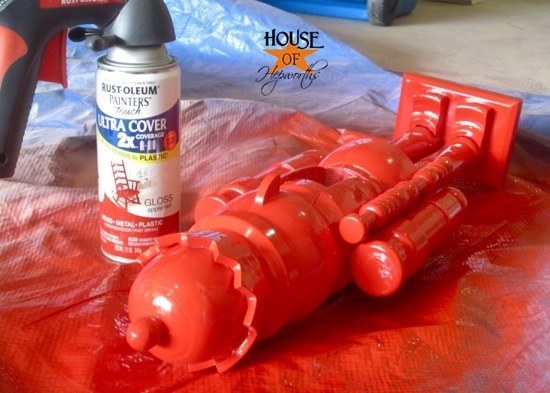 After the primer dried he got several coats of the Rustoleum Ultra Cover 2x Apple Red in a glossy finish. I started by painting all sides of him while standing up. And then to get any places I may have missed I laid him on his side and painted again. When he was dry I flipped him over and did the other side. When he was dry he resumed position on my mantle. I just love how much the nutcracker really pops now that he’s bright red. Next to the fireplace is our family tree (the only tree we are putting up this year) filled to the brim with ornaments we have collected over the years. And I know the clutter on the hearth doesn’t look “professional” or “staged” because it isn’t. 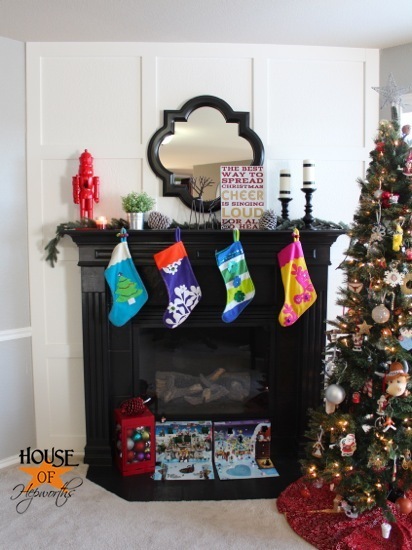 I’m not a professional decorator – just a mom and wife who likes to blog about my home. And in our home, that’s where the kids like to keep their Lego Advent Calendars, which is a family tradition, all month long. And of course, on the mantle is my new Elf quote art I made a few weeks ago. And now, back on topic. If you are tired of your same ho-hum decorations, don’t toss them out and spend more money on new stuff. Just refresh them with some spray paint. Or glitter. Glitter always makes everything awesome. Oh man he’s super cute! Why have I never thought of this?! It reminds me of one I fell in love with at Target, but couldn’t bring myself to buy. 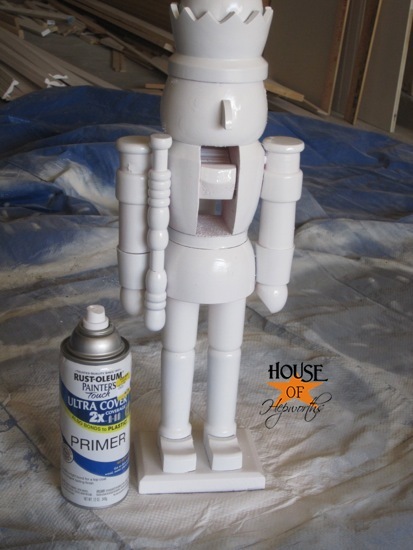 And I love Rustoleum paint, too…you should see my garage workbench…spray paint heaven! I love that, I have seen a few on line but the bright red is my favorite so far. LOVE the new and improved version, will have to scour the thrift store and christmas sales for a few of my own now. From afar he reminds me of a rock’em sock’em robot! Which I happen to dig! Definitely improved! 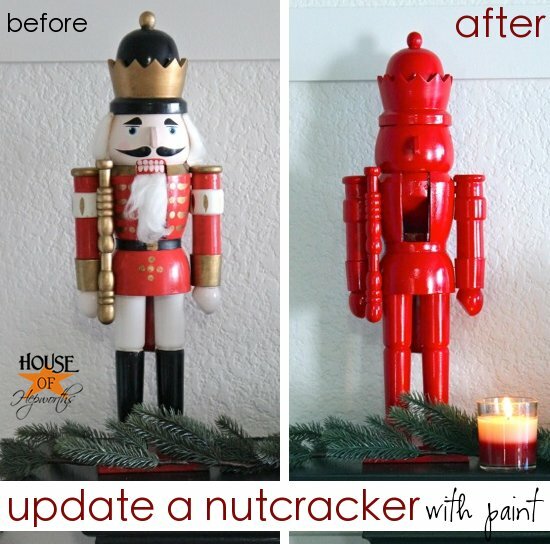 I usually hate nutcrackers but I’ve seen a few of these solid colored ones and they are so much better! 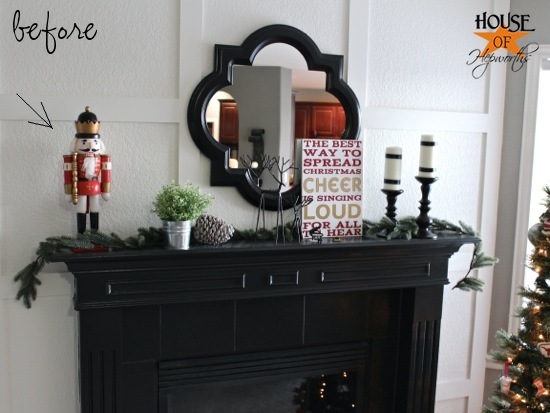 Love the update to your nutcracker, but I especially love that you didn’t stage your fireplace. You see so many blogs with their staged decor that is definitely not done with kids in mind. I like to see how other families decorate. Fun! At first I was like; hrm, that almost looks a bit like an action figure, but once I saw it on the mantle it totally made sense. Sometime I love those fun, instant gratification projects! I thought it looked nice with the white primer on too! I’m so sad that people didn’t like this guy. He’s awesome! I think nutcrackers look kind of creepy too, so I’m all for ripping off their hair and giving them a modern update (especially the K-mart/Thrift store ones)! Now this is a nutcracker I can display!!! this makes it so much cuter…Great idea! I guess I’m the only one that sees this and wonders how anyone could ever thinking a sprayed over nutcracker could ever be as cool as the original. Makes me sad. I’d rather just have all your nutcrackers than see them destroyed. A lot of nutcrackers are limited editions and handmade. I agree with you. I don’t understand why anyone would do this to a nutcracker. It just feels wrong to me to take a little wooden soldier and rip his hair off and paint over his face. There’s so much detail and personality in them and to just paint over all that for the sake of “modernism” just seems like a thoughtless way to jump on a “this would make a good pinterest project” wagon. Oh no! What did you do to that poor nutcracker. He was lovely before with great design and decorations. Now he’s just a blob of red. Definitely a no. A very big no. I agree Gimpy and Kelsey. He was perfectly fine as is . Nutcrackers are a time honoured Christmas tradition and express great workmanship through the craftsmen or carpenters who make them. They’re also as you said often replicas of limited edition works or are a limited edition in and of themselves. There’s a reason The Nutcracker ballet is a classic piece. Oh no! 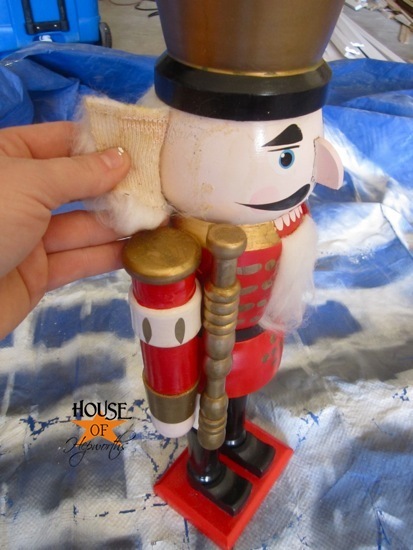 What did you do to that poor nutcracker. He was lovely before with great design and decorations. Now he’s just a blob of red. Definitely a no. A very big no.